Mark Hogue is the Dispatch Team Leader for Action Ambulance. 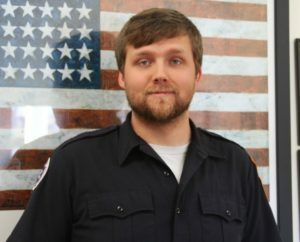 Mark began his EMS career in 2014 when he joined Action as an EMT-Basic. Mark became an EMT to help those in need, but moved into Action’s Dispatch Call Center to learn the other side of EMS. Mark enjoys the people he works with, and builds great relationships with the customers at our facilities. Mark is always seeking ways to improve the client experience and is dedicated to developing himself and others on a daily basis. Mark demonstrates highly-developed multitasking skills in the busy Dispatch environment. Always calm and collected, Mark dispatches necessary resources while continuing to manage other calls. Mark plans to continue to his career as a dispatcher and trainer, and hopes to grow with Action Ambulance Service. Mark loves to spend time hiking with his dogs and is also a talented mechanic. Mark enjoys working on and (legally) racing cars.